cultures. But Sheninger, who just a few years ago had little interest in new technology, has taken that transformation to a new level. Harnessing the power of social media, he’s created a learning environment that is fully in sync with the world his students inhabit. 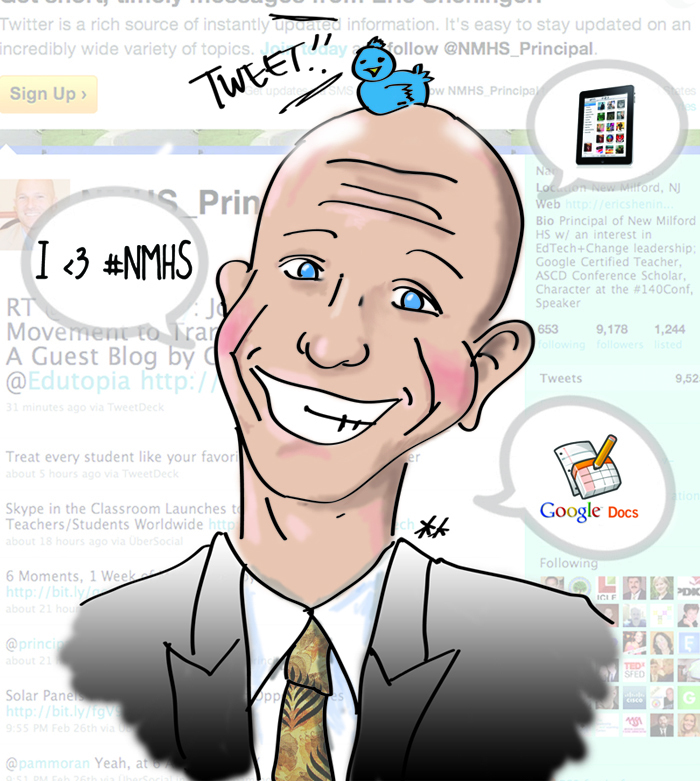 Sheninger and his teachers use Facebook and Twitter to communicate with students and parents, and students use social media to plan events. In class, teachers routinely ask kids to power up their cellphones to respond to classroom polls and quizzes. Rather than ban cellphones, Sheninger calls them “mobile learning devices.” He also replaced the school’s “static, boring” website with what has become a heavily-used Facebook page, and his teachers encourage students to research, write, edit, perform and publish their work online. “If we can engage students the way that they are engaged outside of the school, we are going to see increases in achievement, in attendance rates, graduation rates, and students are going to find their learning much more relevant and meaningful.” “They will develop skillsets that will be relevant for their entire lives and careers”. Eric Sheninger has been an educator for more than 10 years. He’s currently the principal at New Milford High School in New Milford, N.J., and is responsible for preparing over 650 students in grades 9–12 with essential 21st century skills that will enable them to be successful, productive members of society. Sheninger has been recognized nationally as an administrator who once shunned technology but now welcomes and advocates for it in his home district, also helping educate other educators on how to integrate it into their classrooms. Sheninger is a NASSP Digital Principal Award winner (2012), Google Certified Teacher, ASCD 2011 Conference Scholar, co-author of “Communicating and Connecting With Social Media: Essentials for Principals,” writer on education for the Huffington Post, co-creator of the Edscape Conference, and was named to the NSBA “20 to Watch” list in 2010 for technology leadership. He now presents and speaks nationally to assist other school leaders in embracing and effectively utilizing technology. His blog, A Principal’s Reflections, was selected as Best School Administrator Blog in 2011 from Edublogs. This entry was posted in Information, Social media and tagged Education, Erci Sheninger, Facebook, Principal, Social media, Technology, Twitter, USA. Bookmark the permalink. An inspirational piece about an inspirational school leader.